and Tino Muinkua appears on this album from I don’t know what year. On a label that says ‘Muzikana’. Get it and spread it..
niet welk jaar. Op een label dat ‘Muzikana’ heet. Haal binnen, luister en geef weer door.. This is great Moos. 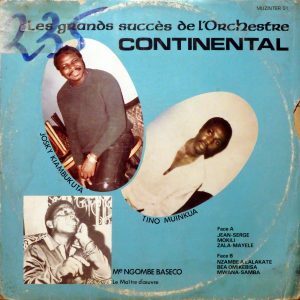 Do you have more on Orchestre Continental? I am trying to get a complete collection of their great work.. This is really nice. Thank you, Moos! Thank you for this rare LP. Josky was such a good singer. I never get tired of him. I did some searching for this LP but found no info besides of the one you have shared. It looks like the LP is printed around 1975 but have no proof of it. Title for song 06 Mwana-Samba is Mayi Baboya. some of the songs have been released in CD and digital format if you don’t mind those formats. Nakobondela released as Nakobondela Bolingo, Ya Vero and Mama Na Nicole for sure. Such a great short-lived band.